UPDATE OCT 18 2018 – You CAN now use a GPO to block the public Microsoft Store but keep your private corporate Store. See our short explanation HERE. After working on setting up a private Microsoft Business Store (businessstore.microsoft.com) I was shocked to find that I could not disable the Public Microsoft Store through any of the settings. I put a few hours into searching and reading but could not even find someone saying it cannot be done, so I gave up and called support. However, when users click a link for an app, it tries to launch the the Windows 10 STORE app. So that did not work either. 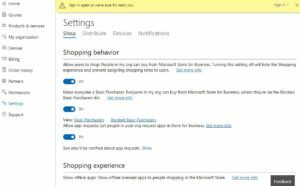 After some research the tech confirmed that the only way to block the public Store but keep your users with access to your private “Microsoft Store For Business” is through InTune. For me that was the end of the road as my client is not going to license InTune. However, in case you want to know how to set it up, read on! Now it’s possible to disable the Windows 10 public store while keeping access to the business store (Windows Store for Business). To block the public store, you need to create a new custom Windows 10 policy in Microsoft Intune (we create a new one because this one will target users and not devices). From “Policy“, create a new “Custom Configuration” policy for Windows 10. Create a new OMA-URI setting. You will find details on the CSP policy reference page. SOLVED: VIDEO: What is Tough Tech?